The Bounds of Sense: Fifty Years On. P.F. Strawson’s The Bounds of Sense was published in 1966. This pioneering commentary on Immanuel Kant’s Critique of Pure Reason has been incredibly influential, both in Kant scholarship and in theoretical philosophy more generally. Strawson’s identification of a necessary structure to our thought and experience, his criticisms of inflationary metaphysical thinking, and his deployment of a method of transcendental argument have provoked and inspired in equal measure. In Hilary Putnam’s words, The Bounds of Sense ‘opened the way to a reception of Kant's philosophy by analytic philosophers’. This workshop will use the half-century of Strawson’s book as an opportunity to reassess its significance, in terms of its substantive discussion of topics in theoretical philosophy and also as a commentary on and interpretation of the Critique of Pure Reason. 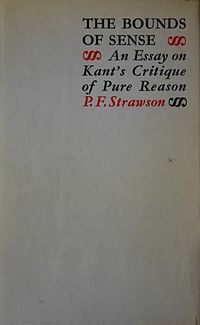 Paul Snowdon, 'Peter Frederick Strawson', Stanford Encyclopedia of Philosophy. Anil Gomes, 'Kant, the Philosophy of Mind, and Twentieth-Century Analytic Philosophy', Part II. Further information, including the final programme, will be sent to registered participants. Venue: the workshop will take place in the Danson Room at Trinity College, Oxford. Information about getting to Trinity College can be found here. Accessibility: the room is fully accessible to wheelchair users. Please email me if there are other things we can do to make the workshop accessible. Lunch & Refreshments: tea, coffee, and lunch will be provided. Dinner: if you're interested in going out for dinner after the workshop, let me know and I'll try and make arrangements. I'll be looking for somewhere which won't cost more than c.£25-30 per person. You can express an interest in going out for dinner on the conference registration page, and I'll get back in touch with more details closer to the time. Support: the workshop is supported by the John Fell OUP Research Fund, the MIND association, the Faculty of Philosophy at the University of Oxford, and Trinity College, Oxford.